Traffic on I-270 by Mario Roberto Duran Ortiz licensed under Creative Commons. A bill that would require Governor Larry Hogan to study the environmental and financial risks of the proposed expansion of I-270 and I-495 has until Monday, April 8 to be passed by the Maryland State Senate. Advocates have raised concerns that, as it stands, his proposed highway widening would make air and water pollution significantly worse in the region, and potentially displace existing communities. The proposed $11 billion plan would add four toll lanes to the Capital Beltway and I-270. Rather than improving public transit options to provide traffic relief, proponents’ decision to focus on widening the highways would add hundreds of miles of new lanes, a practice which has repeatedly been shown to encourage more people to drive on them. Greater Greater Washington is partnering with Sierra Club Maryland to highlight this issue. Hogan's proposal would lay the groundwork for the largest public-private partnership (in which the government solicits a private company to finance a public infrastructure project) for highways in the world. In light of the scale of the likely arrangement, the bill HB 1091, sponsored by Delegate Jared Solomon (District 18), calls for a more substantive review of the project’s financial structure. A press conference for Jared Solomon's P3 Transportation Safeguards Act (HB1091) in Annapolis. Image by Maryland Sierra Club used with permission. Currently, there are no laws on the books that require Maryland to review the environmental impacts of a large transportation project before the state locks in the major details of that project. There are also no laws that require the state to review the impact of a public-private partnership on the state’s credit rating before Maryland enters into an agreement that may last as long as 50 years. With the General Assembly adjourning April 8, HB 1091 has emerged as the one remaining bill that, if passed, would prevent the state from recklessly rushing into this major proposal. HB 1091 as amended has been passed by the House of Delegates. 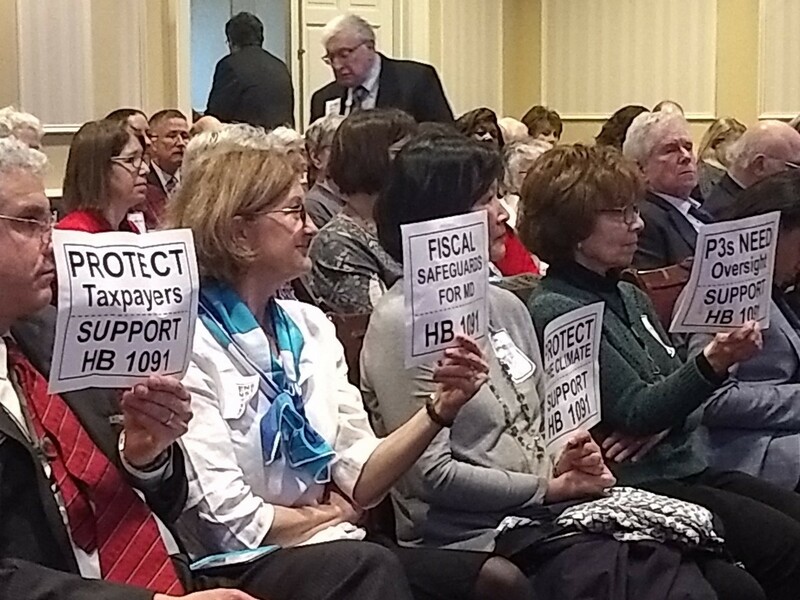 On April 3, the Senate Budget and Taxation Committee heard testimony from many advocates as well as from Maryland Department of Transportation (MDOT) Secretary Pete Rahn, but did not vote on it. Only if the Committee holds a vote and the bill passes will the bill go on to the full Senate for a vote. The General Assembly will be meeting over the weekend, yet the challenge would be getting all the potential discussions and revisions done before the General Assembly adjourns on the evening of April 8. Even if it is passed by the General Assembly, it is subject to a veto by the governor. Separately, the General Assembly has already passed the budget for the year. A provision added to that budget called for the highway expansion "pre-solicitation report" on the highway expansion proposal Maryland DOT (submitted in December for review and comment) to be withdrawn until it can include an environmental impact statement on the project. HB 1091 as amended also calls for this. Advocates at a hearing in Maryland State Senate budget and taxation committee on April 3. Image by the author. On Thursday, a press conference was held in House building with dozens of Delegates and local elected officials from Prince George’s, Frederick, and Montgomery County, including County Executive Marc Elrich. 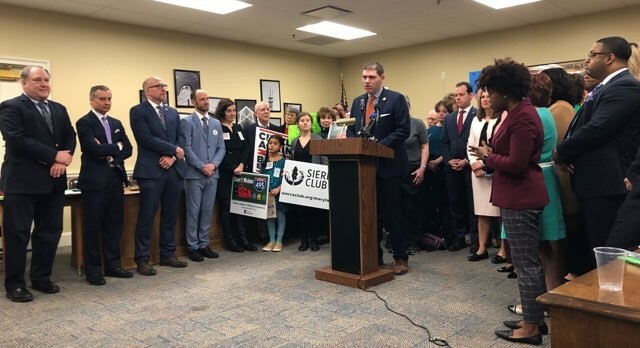 These leaders joined with Citizens Against Beltway Expansion, Don’t Widen 270, Sierra Club, and Chesapeake Bay Foundation to urge state senators to support the common-sense measures in the bill that would allow the state to make smart, informed decisions on its future. Whether or not HB 1091 is passed by the General Assembly, MDOT is expected to seek approval from the Board of Public Works (BPW) later this month on the highway expansion "pre-solicitation report." Advocates are hoping the BPW, or at least the two Democratic members of the BPW (Comptroller Peter Franchot and State Treasurer Nancy Kopp, a witness at the bill hearing), will be responsive to the budget provision and HB 1091 as amended and postpone approval of the pre-solicitation report until it includes an environmental impact statement. Tell your Maryland legislators that we need to understand the environmental impacts and financial risks of the project before Maryland enters into long-term partnerships with any contractors.